According to Cambridge Dictionary, the verb enhance means “to improve the quality, amount or strength of something.” Similarly, in Myoskeletal Alignment Techniques (MAT), the term enhancer is used as a noun to describe a therapist-directed movement cue that neurologically boosts, intensifies, and heightens a therapeutic outcome. In Image 1, I demonstrate and describe a MAT enhancer for a client presenting with excessive thoracic kyphosis and upper crossed syndrome. Image 1. With chin tucked, the client deeply inhales, lifts both elbows toward the ceiling, and pushes her belly out. 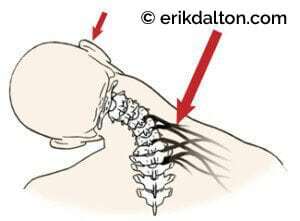 My left arm assists this trunk-extension effort, while my right palm gently compresses and lifts her rib cage to stretch the front line and mobilize motion-restricted joint capsules, ribs, and intercostal muscles. Adding the enhancer to her MAT treatment boosted the involvement of her nervous system, allowing better rib-cage mobility, shoulder-girdle stability, and fascial front line extensibility. To help retrain her brain for this new posture, she was asked to perform the enhancer daily, preferably in front of a mirror. MAT enhancers serve three primary purposes. Ben was referred by an orthopedist for soft-tissue damage sustained in a rare side-to-side whiplash injury when his car was hit on the driver’s door six months earlier (Img. 2). The neck pain had subsided, but he could barely turn his head left and his orthopedist prohibited Ben from driving until he could turn his head to look in the rear view mirror. Image 2: Overstretched nerves and connective tissue cause the brain to layer the area with protective spasm that may lead to contractures. Upon seated examination, his passive range into right cervical rotation, flexion, and extension was normal, but he could only manage 30 degrees of left rotation. A couple myoskeletal enhancers were used to determine if his primary restrictor was neural (protective guarding) or the result of residual soft-tissue damage. In many pain-free whiplash clients, the neck becomes sensitized and the brain will still perceive threat even though tissue damage to the area has long healed. In some cases, the use of novel movement enhancers can trick the brain into loosening the reins and dissolving the protective muscle guarding. Here’s a description of one of my favorite MAT enhancers that helped this client. Image 3. Ben inhales and slowly looks over his left shoulder while my right fist hooks and drags the upper-trap fascia posteriorly. Upon exhalation, he gently right rotates against isometric resistance from my left hand to a count of five and attempts more left rotation. The seated treatment began by slowly rotating Ben’s head left to the first restrictive barrier and holding it there. His movement enhancer was to inhale deeply and slowly rotate his shoulders and torso as far right as comfortably possible several times and relax. Essentially, this maneuver is the same as asking him to turn his head left, but Ben’s brain did not perceive the torso-twist enhancer as threatening, and through graded exposure (pain-free repetition), his flexibility improved. Image 4. SCM receptor release. Ben lifts and slowly left rotates his head to the barrier while my soft fingertips hook the sternal head of his right SCM. Upon exhalation, he drops the right shoulder and slowly looks toward the table to a count of five and relaxes. Then it was time to deal with the right-sided sternocleidomastoid (SCM) and upper-trapezius contractures that were visible as Ben turned to end-range. Image 3 demonstrates and explains a basic, but effective, MAT contracture routine that was chosen to conclude Ben’s first session. When Ben returned the following week, he was asked to demonstrate the torso-twist enhancer I’d ask him to practice daily in front of a mirror. I was impressed with his progress but still observed and palpated strain in his right SCM and at the base of his skull as he left rotated to end-range. Notice in Image 4 how my soft finger pads remain stationary, allowing Ben to left rotate at his tolerance level, and in Img. 5 how I use an optic-nerve enhancer via the suboccipital muscles to help align the atlas-axis joint. Image 5. Atlas-axis release. Ben’s head and neck are flexed 90 degrees and left rotated to the first restrictive barrier. Using the suboccipital muscles as enhancers, Ben is asked to inhale and look over his right shoulder while my hands resist to a count of five. Upon exhalation, his head is rotated left to the next restrictive barrier. Repeat three to five times.